Gretsch has announced a revamp of its affordable Electromatic range, including some new additions to the series (Special Jet, Jet Club, Corvette III and Double Jet with Bigsby) and some updated older models (Pro Jet and Pro Jet with Bigsby). Fender has been busy recently! Not only have we had the Graham Coxon signature Telecaster and the Kurt Cobain signature Jaguar in the last month, but they've somehow found time to give the Gretsch Electromatic series an overhaul too. First up, there's the revamped Electromatic Pro Jet (pictured, MSRP £418.80), which has been upgraded with dual 'Black Top' Filter'Tron pickups, 'hump block' inlays and an Adjusto-Matic bridge. It's the only new Electromatic to feature a left-handed model too. There will also be two vibrato variants: the Electromatic Pro Jet Bigsby and a double cutaway vibrato model the Electromatic Double Jet with Bigsby, both of which share an MSRP of £514.80. 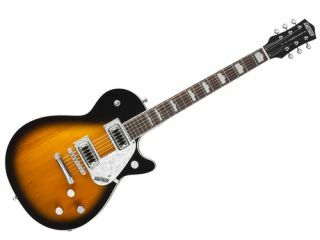 The most affordable of the new models will be the Electromatic Special Jet (MSRP £238.80), which features a solid basswood body (as opposed to the chambered body of the Pro Jet) and Gretsch dual-coil humbucking pickups. In addition, another variant on the Jet shape, the Jet Club (MSRP £274.80) has also been announced. This one features the same pickups as the Special Jet, but has the Pro Jet's chambered body and maple top. Last but not least is the Electromatic CVT III (MSRP £274.80), which utilises the thin Corvette body shape and features three Gretsch mini dual-coil pickups - giving it a little more gain than the rest of the range. For more information and pictures check out the full press release and Gretsch Electromatic gallery over on the main MusicRadar site.